How to Pass Style Me Girl Level 52, "Tropical Paradise," & Get 3 Stars With No Cash Items! | I Style Me Girl! 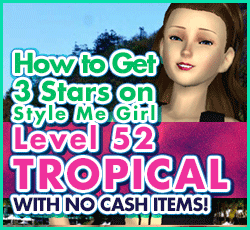 How to Pass Style Me Girl Level 52, "Tropical Paradise," & Get 3 Stars With No Cash Items! In Style Me Girl Level 52, "Tropical Paradise," theme, the player is on vacation and gives model/boss Victoria a suprise style fit for a "Bahama Mama." I used only silver coin items and items that came with the game, no cash items, for my three star earning tropical style. To find out how to pass Style Me Girl level 52, "Tropical Paradise," without using cash items, continue reading! The items I used to pass and get 3 stars on Style Me Girl Level 52, "Tropical Paradise," are pictured and described in the list below. The "Closet Items," screen capture image (below right) can be clicked to enlarge if you'd like a more detailed view. When i did it i got three stars. Here's what i used: the same hair, a rainbow beach bag, red and green beaded earrings, the same bracelet, same flip flops. I went to the little store and got a floral dress. Finally i used a pink swim suit i already had. I hope that helps. I still can't get three stars. Someone please help.